Well, the Olympics is over for another four years, and I really enjoyed this one, for all its undercurrents. Australia did wonderfully. We have come to expect it of ourselves (the nation), and those expectations are certainly high. On a population basis Australia produces more medal winners than any other nation. WE LOVE THE GOLD. Even from my home town we have teenagers going away regularly for State and National titles in a range of sports – rugby, soccer, hocky, judo, squash, throwing, cycling. swimming. And I think world over we probably like to be associated with Gold, whatever the association. So when Cathy Freeeman was on top of the world sprinting, it was great for me to say, she’s Australian, I know her mother (Cecilia) although by meagre acquaintance, and she had been brought up in a Baha’i family. Well, I expect that half of the medal winners at the Olympic games are Christian by sheer population of the Christian community in the strongest sporting nations, but like Australia’s level of excellence, it is almost incredible that there is a member of such a small religion like the Baha’i Faith in th emedal winners. Never theless, I was just excited to wake this morning with the news that the winner (YES, THE GOLD) of the men’s triple jump was Nelson Evora, a member of the Bahá’í Faith from Portugal. 24 year old Mr Evora jumped 17.67 metres, adding the Olympic title to his world crown and giving Portugal its first Olympic gold medal in 12 years. Born in Cote D’Ivoire where his parents had gone to live from Cape Verde, Mr Evora relocated to Portugal when he was five. The family moved into an apartment that happened to be on the floor above his future coach, trainer and mentor, Joao Ganco, a member of the Portuguese Bahá’í community. 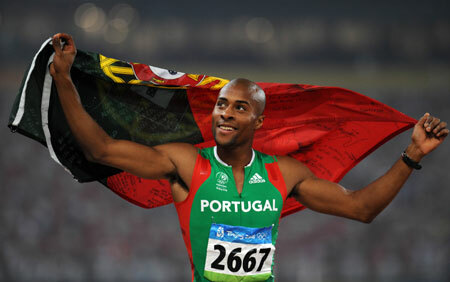 Mr Evora became a Portuguese citizen in 2002 after previously competing for the Cape Verde Islands. Last weekend I was looking for headwaters of a creek through rainforest that had become overgrown with ‘wait-a-while’ vine, when I stumbled and placed my hand on the trunk of a ‘stinging plant’. These nasty trifeds are covered with thorns with silicon hairs that pierce the skin and cause excruciating pain. I hit the plant with the tips of three fingers on my left hand and within ten minutes they were very swollen, there was pain radiating up to my chest, and my axilla lymph nodes were swollen. I shortened my excursion but still took 1.5 hours to get home. I waxed the area to get any exposed silicon hairs out. I thought I could put up with it but after another hour I rang my GP who got me down and hour later for a morphine shot. The morphine let me go to sleep for three hours but occassionally I would wake with a sting of pain in my fingers. The next morning the swelling was down and, with just some panadeine I could go to work which takes a lot of hand use. Now the fingers feel fine unless I put them under cold water and then the pain comes ferociously back. So, tonight, I went to my weekly game of touch football with some other middle aged fellows. Half and hour into the game I pulled a calf muscle. I am becoming paranoid about my mouse. There it sits, begging for use. I reach tentatively as visions of tendinitis drift through my mind.